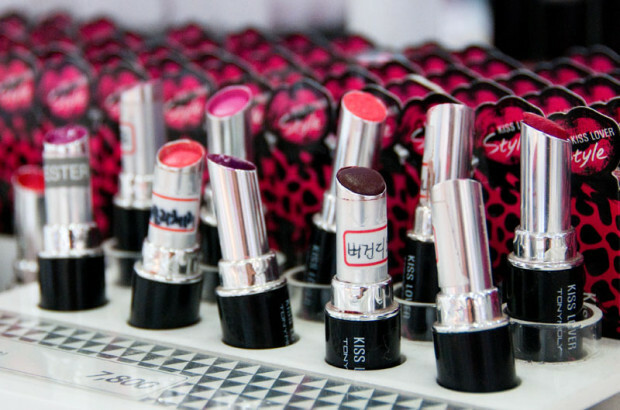 Korea has a plethora of high quality cosmetics chains that sell everything from standard cosmetics to natural ingredient-based makeup and skin care products to expensive anti-aging systems. Korean beauty products are diverse, fairly inexpensive and are internationally renowned for their quality; this gives the image-conscious person a wide variety of products to choose from here. 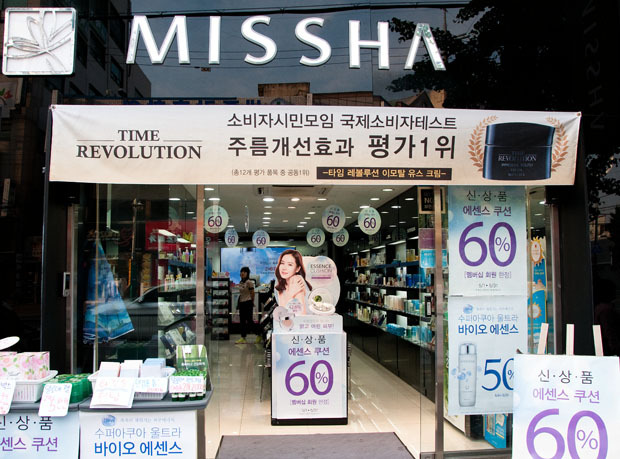 While Jochiwon doesn’t have the large, upscale beauty shops one can find in major metropolitan areas like Seoul or Daejeon, it has several smaller outlets for the major beauty chains, and they carry almost anything you might want in the way of cosmetics, skin care products and hair care items. A small city like Jochiwon has one advantage over its larger neighbors—almost all of the beauty shops are located conveniently within walking distance from one another. They are mostly in the area of the train station on Jochiwon-ro, the main road that runs directly out of the train station, making them rather easy to find. The following is a list of Jochiwon’s beauty stores, their locations, the types of products they stock, and our Dish picks of their best products. Happy beauty product hunting, Jochiwonians! 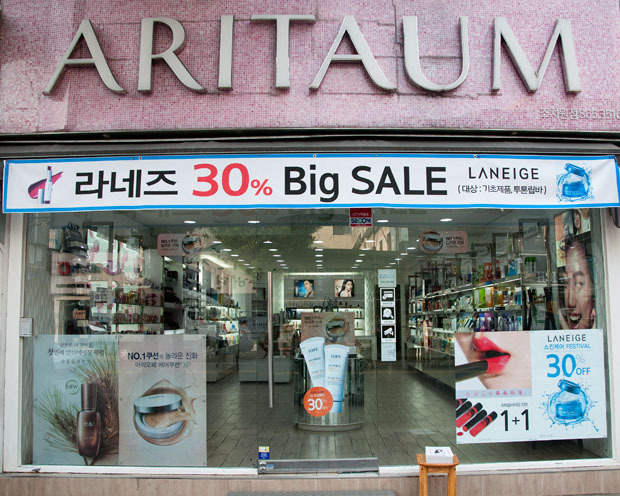 Aritaum carries cosmetics from Korean brands like Iope, Laneige, Mamonde and Amore Pacific. They have a complete line of skin, body and hair care items, makeup and men’s cosmetics. Their cosmetics are classy, glamorous and slightly less youthful in their aesthetic than you will find in shops like Tony Moly and Etude House. Recommended Product: They have a wide and unique selection of fun, glamorous and funky MOD nail products from glitters and topcoats to gel nail polishes all ranging from ₩3,500-₩6,000. Tony Moly carries its own proprietary brand of cosmetics, skin care, and hair products. Its makeup aesthetic is generally light, bright and flirty and the packaging is incredibly cute, with everything from its line of moist and luscious Fruit Princess Gloss to the adorable panda bear-shaped packaging of its Panda’s Dream Magic Whitening Cream. The prices are reasonable and they have an excellent variety of face sheet masks and other skin care products. Recommended Product: Fruit Princess Gloss. It comes in a variety of bright and luscious shades and is reasonably priced at ₩5,460. 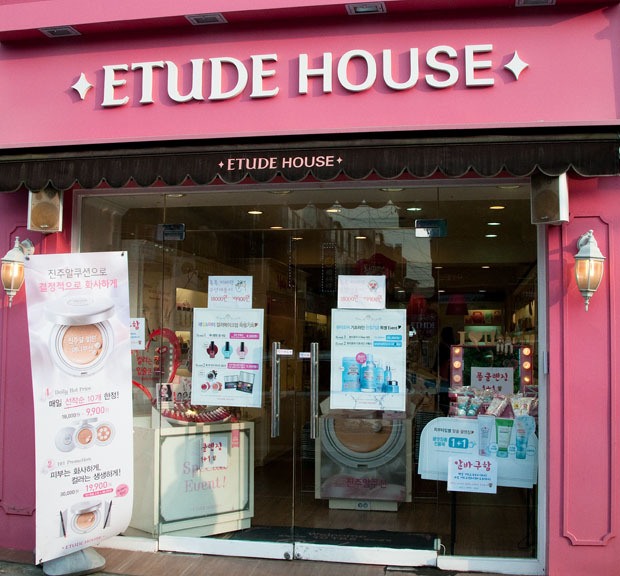 Etude House carries a wide selection of body care products and cosmetics. The shop is brightly lit and pretty with the pastel aesthetic of a French parlor. They have a wide variety of cosmetics in light and bright colors with incredibly cute packaging making their makeup a natural complement to Tony Moly products. Recommended Product: Their Lash Perm Mascara is non-clumpy and lush and ranges from ₩11,000-₩13,000. Nature Republic carries a wide variety of bath and skin care products as well as cosmetics, but it is in their skin and face care line that the store really shines. They have natural, plant-based skin systems and face masks with tasteful packaging and an array of light body mists with floral scents like Peony and Rose. While their makeup selection isn’t as varied as other beauty shops, their great skin care line is evenly complemented with a nice selection of soaps, body washes and hair care products. Recommended Product: They have many varieties of plant-based collagen masks for skin toning and rejuvenation that are reasonably priced at ₩1,000-₩4,000. Missha has a nice atmosphere with a good selection of perfumes and cosmetics. They have a diverse and lovely line of nail polishes and they also have many different skin care systems like their light and gentle Super Aqua line. Recommended Product: They have a good line of fragrances from light and floral scents to musks that range from ₩17,800-₩35,000. 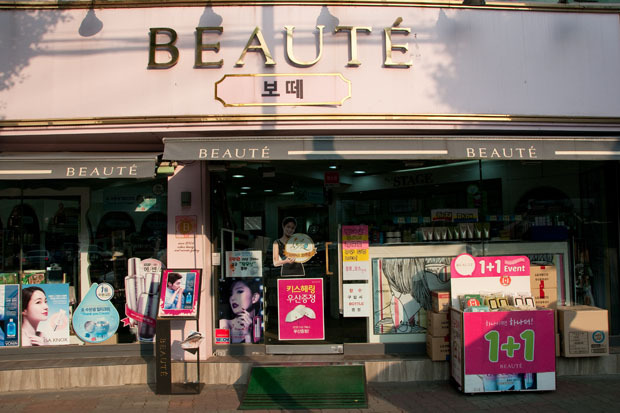 Beauté does not have a proprietary line of cosmetics like many of the other Korean chains but also unlike them, stocks a selection of foreign beauty and personal care products. The atmosphere is cramped and disorganized, but may be the best bet for someone looking for their favorite non-Korean brands. Recommended Product: They have the complete line of Nivea lotions, deodorants and body sprays starting at ₩7,000. 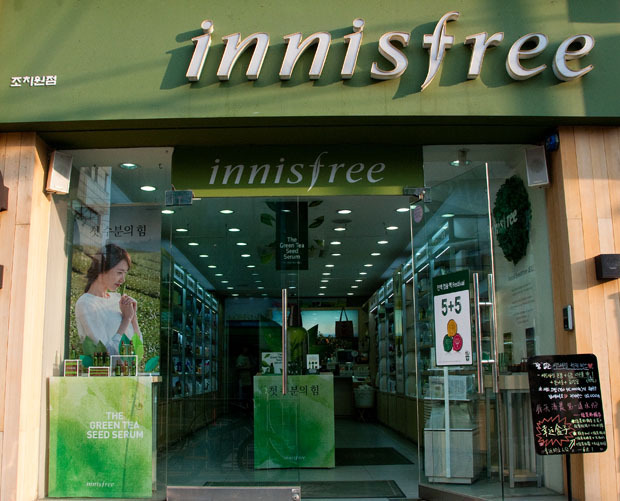 Innisfree carries a good selection of eco-friendly beauty products and has the best men’s section of any of the beauty shops in Jochiwon. 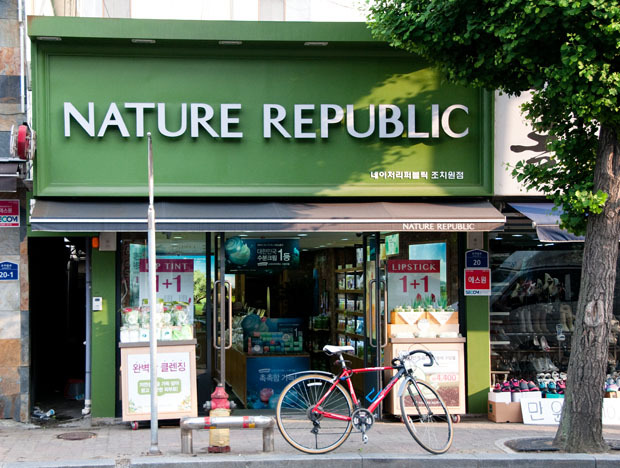 Like Nature Republic, their products are eco-friendly and plant-based but they carry a larger selection of makeup. Reccomended Product: Forest For Men Ultra All-In-One Cream, a total skin toning, exfoliating and moisturizing system for the image-conscious man for ₩25,000. 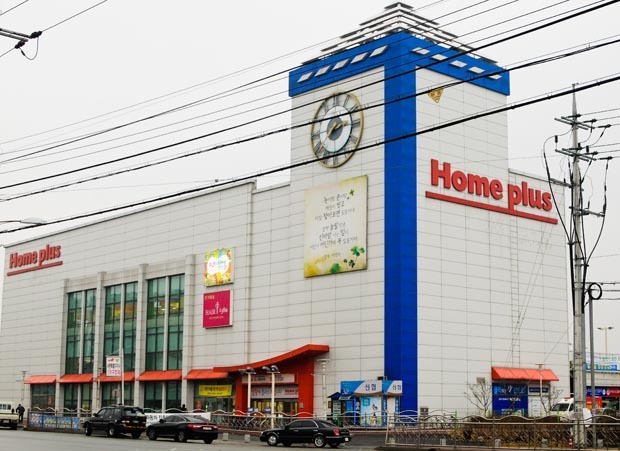 Homeplus: I would be remiss in my description of the beauty ships in Jochiwon if I didn’t mention Homeplus, which has Skin Food, It’s Skin, Mamonde and Nature Republic kiosks inside, as well as a general toiletries and beauty area with a wide array of hair care, skin care and general personal care products. Unlike the other shops in the area, it carries several western brands so those looking for familiar favorites might get lucky. For those that are fans of Mamonde products like I am, they have a kiosk on the grocery level that has a good selection of Mamonde BB Creams, nail polish and most of their other cosmetics. The Skinfood kiosk has many fruit and plant-based cosmetics and skin products. Their cosmetics have a light, naturalistic and youthful aesthetic but the shop’s particular strength is its selection of skin and face products, which all use natural ingredients and are supposed to be gentle and good for all skin types. Recommended Product: Skin Food’s Black Sugar Face Mask. It is a heavy, grainy paste that gently exfoliates and moisturizes, making it an ideal product for the winter. It costs ₩7,700.